TDmonthly Magazine Products by BE AMAZING! Just add water, snap the lid shut and stand back. The bubbling action of the chemical reaction builds up pressure inside the can until the top POPS and flied through the air. Kids can mix up their own top-popping fuel mixture and put the Snap Cans to the distance test. Attach the foam rocket to the Snap Can and shoot the rocket high into the air. This kit uses a variety of visual and tactile experiments that introduce kids to the world of plant science. Each experiment is designed to teach kids a different principle about plants, including seed purpose and description, capillary action, water cycle, DNA, sprouting, horticulture, plant biology and natural product science. An exciting range of experiment types are used to represent or explain plant biology or to use plants in the experiment. Just add water and watch these little clear and colored beads grow into giant jelly marbles. Before soaking, sort the different colors and ask science questions like “How are these alike, and how are they different?” Will the different colors grow to different sizes? Try it and see! Afterward, kids can have lots of fun playing with their experiments. Find a water-safe surface and play the slimiest game of marbles in town, or try them out as new jelly bouncy ball. Kids can even try to grow the amazing spheres in different liquids, like milk, vegetable oil, or salt water. Use a notebook and record hypotheses and observations. This kit is for kids as they begin to explore, experiment and discover their world. Over 70 fun exciting experiments to stimulate young minds. Launch date: 2012. Harness the power of Mentos candies and soda into a racing car that travels 200 feet or more. Launch date: 2012. Kids will explore the magic of crystal chemistry as they design and grow their own crystal ring. They will discover the secrets of crystal chemistry, learn to make sugar jewels and find out which household salts make the best crystals using the included magnifying glass to study them. Launch date: 2012. Kids will learn over 30 amazing tricks and effects and learn the science principles behind them. Science and magic are very closely related. In fact, many science experiments look like magic and many cool magic tricks are science based. Kids will make water disappear, learn to read minds, mix up some disappearing orbs, levitate magnets, lift up a bottle of rice with a chop stick, stick pencils through a bag of water with noting leaking out, write secret messages and much more. — In a late Summer 2012 survey, Joe Berardoni Sr., owner of Pun's Toys in Bryn Mawr, Penn., told TDmonthly that "Any of the Lab-in-a-Bag kits from Be Amazing Toys" become their best selling Science & Nature toys. 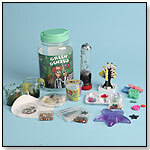 With more than 60 activities, this set can serve as a great introduction to the wonders of science. It allows kids to set up their own science lab and investigate activities in chemistry, physics, biology, geology, weather, magnets and electricity. Activities include Insta-Snow , the Geyser Tube (Mentos and diet soda geyser), Water Gel, Gravity Goo, Windbags, Twister Tube and more. "We have billed it as “the best of Be Amazing!” since it contains many of our signature science activities," Renee Whitney, president of Be Amazing Toys, told TDmonthly. Launch date: June 2010. The largest Lab In A Bag ever is available with 30 activities. It contains popular experiments touching on everything from chemistry and physics to biology and geology. With this ample spread of green camouflage material and assortment of clips and hooks, children can erect an enclosure of whatever shape they like with the assistance of handy surfaces or objects — a couple of chairs and the wall, a card table and the corner of the bedframe, or wherever else their imaginations can take them. The set includes neon light wands to illuminate the inside of the space, a technique used by real-life law enforcement and security in low light. — “Build-A-Fort by Be Amazing,” said Jeanette Lauture, owner of Aunt Jean's Toys and Treats in Montclair, N.J., who named this product as one of her top sellers in a May 2009 survey of furniture and play houses. — Three of 43 retailers said tents are their best-selling play house item. Not only are MENTOS® great to eat, but these amazing candies are loaded with wonder. Learn how to create an enormous geyser by combining MENTOS® with soda. The eruption is amazing—up to 25 feet high—and so is the science just beneath the surface. The Geyser Tube™ allows you to load the candies and safely disperse them into the soda bottle. 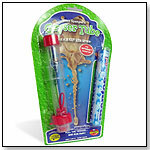 — When asked about their best selling novelty toys in a September 2011 survey, Mary Porter Green, owner of The Curiosity Zone in Ashburn, Va., told TDmonthly: "We sell lots of the Geyser Tubes from Be Amazing! Toys." — In a Fall 2013 survey, two out of 12 retailers told TDmonthly that Be Amazing was a best-selling brand of science toy. Over a million viewers tune in each week to see what cool science experiment Steve Spangler has up his sleeve. He shoots potatoes, makes toilet paper fly and turns two-liter bottles of soda into giant geysers all in the name of getting people of all ages turned onto science. The now-famous Mentos and Diet Coke experiment turned into one of the most viral marketing campaigns in the history of the Internet. Just drop an unwrapped roll of Mentos into a freshly opened two-liter bottle of soda and the pop becomes a geyser of foam guaranteed to make onlookers cheer wildly and run away. Spangler designed a Mentos-releasing tube so that kids of all ages can make their own Great Geysers without getting soaked. Just load up the tube, stand back and pull out the pin with a string. 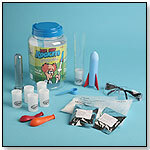 This set includes more than 15 activities and allows kids to set up their own geyser lab. Kids will become after-dinner science magicians as they uncover the iron in their food, stretch a banana, bend spoons and mix up a batch of quicksand gravy. The beauty of the Lab of Luxury Kit lies not only in its end product, but also in its educational value for growing minds. “The Lab of Luxury is a science kit that allows girls to create make-up,” Bill Rayment, owner of Toy Crossing in Harbor Beach, Mich., told TDmonthly. Yet it also allows girls to learn the science behind the make-up they wear. This kit provides components such as citric acid and sea salts to make products as various as fizzing bath balls and glittery lip gloss. Using this science kit, kids will learn the secret of the Giant Test Tube and how to make Touchable Bubbles that don’t pop. They can make a super bouncing ball and 20’ of gooey, slimy worms. Almost everything kids need comes in one clear vinyl bag for easy clean-up. — In a September 2011 survey, Joe Berardoni, owner of Pun's Toys in Brynn Mawr, Pa., told TDmonthly, "Be Amazing’s Lab in a Bag (any one) does very well here. They have great experiments included and are a good 'birthday present' price." — In a Fall 2013 survey, two out of 12 retailers told TDmonthly that Lab in a Bag was one of their best-selling science toys. When kids mix the two liquids together, they get perfect slime, every time. They’ll learn about polymers and how they work, and why two liquids combine to make an oozy gooey concoction. They’ll learn how to clean their hands with Slime, and make a big Slime bubble. The kit includes Slime solution, Slime activator, mixing sticks, cups and instructions. Launch date: March 2006. From the specimen jar in which the kit is packaged to the secret formulas for making realistic-looking snot, vomit and body parts, this kit screams fun. Kids will be able to grow their own bacteria right at home. This nasty fun kit includes Slime Goo, Worm Goo, Slime Activator, True Color tablets, Growing Body Parts, Petri dish and lid, nutrient agar, cotton swab, clear cup, mixing cups, super-absorbent crystals and instructions. The jar is 18” high and 9” deep. Launch date: March 2006.